Jafar Panahi (Persian: جعفر پناهی‎; born 11 July 1960) is an Iranian film director, screenwriter, and film editor, commonly associated with the Iranian New Wave film movement. After several years of making short films and working as an assistant director for fellow Iranian film-maker Abbas Kiarostami, Panahi achieved international recognition with his feature film debut, The White Balloon (1995). The film won the Caméra d'Or at the 1995 Cannes Film Festival, the first major award won by an Iranian film at Cannes. Panahi was quickly recognized as one of the most influential film-makers in Iran. Although his films were often banned in his own country, he continued to receive international acclaim from film theorists and critics and won numerous awards, including the Golden Leopard at the Locarno International Film Festival for The Mirror (1997), the Golden Lion at the Venice Film Festival for The Circle (2000), and the Silver Bear at the Berlin Film Festival for Offside (2006). His films are known for their humanistic perspective on life in Iran, often focusing on the hardships of children, the impoverished, and women. Hamid Dabashi has written, "Panahi does not do as he is told — in fact he has made a successful career in not doing as he is told." After several years of conflict with the Iranian government over the content of his films (including several short-term arrests), Panahi was arrested in March 2010 along with his wife, daughter, and 15 friends and later charged with propaganda against the Iranian government. Despite support from filmmakers, film organizations, and human rights organizations from around the world, in December 2010 Panahi was sentenced to a six-year jail sentence and a 20-year ban on directing any movies, writing screenplays, giving any form of interview with Iranian or foreign media, or from leaving the country except for medical treatment or making the Hajj pilgrimage. While awaiting the result of an appeal he made This Is Not a Film (2011), a documentary feature in the form of a video diary in spite of the legal ramifications of his arrest. It was smuggled out of Iran on a flash drive hidden inside a cake and shown at the 2011 Cannes Film Festival. In February 2013 the 63rd Berlin International Film Festival showed Closed Curtain (Pardé) by Panahi and Kambuzia Partovi in competition; Panahi won the Silver Bear for Best Script. Panahi's new film Taxi premiered in competition at the 65th Berlin International Film Festival in February 2015 and won Golden Bear, the prize awarded for the best film in the festival. In 2018 he won the Cannes film festival Award for Best Screenplay (tied) for 3 Faces; although he wasn't able to leave the country to attend the festival, his daughter, Solmaz Panahi, read his statement on behalf of him and received the award. Panahi was born in Mianeh, Iran. He has described his family as working class and grew up with four sisters and two brothers. His father worked as a house painter. His family spoke Azeri at home, but Persian with other Iranians. When he was ten years old he wrote on 8mm film camera. He also acted in one film and assisted Kanoon's library director in running a program that taught children how to operate a film camera. Starting at the age of twelve, Panahi would work after school in order to afford to go see films. His impoverished childhood helped form his humanistic worldview that would later manifest itself in his films. At the age of twenty Panahi was conscripted into the Iranian army and served in the Iran–Iraq War, working as an army cinematographer from 1980 until 1982. In 1981 he was captured by Kurdish rebels who were fighting Iranian troops and held for 76 days. From his war experiences he made a documentary about the war that was eventually shown on TV. After completing his military service, Panahi enrolled at the College of Cinema and TV in Tehran, where he studied filmmaking and especially appreciated the works of film directors Alfred Hitchcock, Howard Hawks, Luis Buñuel, and Jean-Luc Godard. At school he first met and befriended filmmaker Parviz Shahbazi and cinematographer Farzad Jodat, who would later shoot all of Panahi's early work. During college he interned at the Bandar Abbas Center on the Persian Gulf Coast where he made his first short documentary films. He also began working as an assistant director on his Professor's films before graduating in 1988. Panahi made several short documentary films for Iranian television through the Islamic Republic of Iran Broadcasting's Channel 2. His first short film, The Wounded Heads (Yarali Bashar), was a documentary about the illegal mourning tradition of head slashing in the Azerbaijan region of northern Iran. In the film, Panahi documented a mourning ceremony for the third Shi'ite Imam, Imam Hossein, where people hit their heads with knives until they bled. Panahi had to shoot in secret and the film was banned for several years. In 1988 Panahi filmed The Second Look (Negah-e Dovvom), a behind-the-scenes documentary short on the making of Kambuzia Partovi's film Golnar. It focuses on the puppet maker for Partovi's film and his relationship with his puppets. It was not released until 1993. In 1990 he worked as an assistant director on Partovi's film The Fish (1991). In 1992, Panahi made his first narrative short film The Friend (Doust), which was an homage to Kiarostami's first short film The Bread and Alley. That same year Panahi made his second narrative short, The Final Exam (Akharin Emtehan). Both films starred non-professional actors Ali Azizollahi and Mehdi Shahabi and won awards for Best Film, Best Screenplay, Best Cinematography, and Best Editing at Iran's National TV Festival that year. Inspired by a story of a young Luis Buñuel once contacting successful film director Jean Epstein to ask for a job in filmmaking, Panahi left a message on Abbas Kiarostami's answering machine, stating that he loved his films and asking for any job on his next film. Kiarostami hired Panahi as his assistant director for the film Through the Olive Trees. Kiarostami had seen several of Panahi's short films and in 1995 said he was "extremely gifted and can be a promising figure in our cinema's future." In 1995 Panahi made his feature film debut, The White Balloon (Badkonak-e sefid), produced by IRIB- Channel 2, Ferdos Films and the Farabi Cinema Foundation. Initially titled Happy New Year, Panahi developed the original story with Parviz Shahbazi and attempted to get funding from IRIB's Channel 1 with the expectation that it would be a short film, but his proposal was rejected. He then showed his original treatment for the film to Kiarostami during the shooting of Through the Olive Trees. Kiarostami encouraged Panahi to make the idea into a feature and agreed to write the script. During their car rides to set while shooting, Kiarostami would dictate the film's script while Panahi taped the conversation and typed the script. Kiarostami also helped Panahi secure funding from IRIB's Channel 2. While casting the film, Panahi traveled throughout Iran in order to include all of the diverse ethnicities of his country as characters in the film. He found lead actress Aida Mohammadkhani at the first school that he visited and immediately cast her as Razieh, but auditioned 2,600 young boys for the role of Razieh's brother Ali before settling on Mohsen Kalifi. He cast non-professionals in most of the supporting roles, including a real fish seller he found in the Rasht market and a college student to portray the young soldier. He also cast professional actress Anna Borkowska as an Armenian woman. In the film Razieh, a strong-willed little girl in Tehran, wants to buy a lucky goldfish for the upcoming Iranian New Year celebration, but struggles to get and hold on to the 500-toman banknote needed to purchase the fish. Panahi worked closely with Mohammadkhani, gaining her trust and acting out each scene for her to mimic while still adding her own personality to the performance. Panahi was most concerned about Mohammadkhani being able to cry on cue, so he would have her stare at him off camera while he started to cry, causing her to cry. Filming began in early April 1994 in Kashan, Iran and continued until early June. Panahi has stated that during the making of his feature debut he "wanted to prove to myself that I can do the job, that I can finish a feature film successfully and get good acting out of my players." He also stated that "In a world where films are made with millions of dollars, we made a film about a little girl who wants to buy a fish for less than a dollar – this is what we’re trying to show." In Iran, films depicting children are the most likely to avoid censorship or political controversy, and The White Balloon was screened exclusively in theatres that specialized in children's films. Because of this the film had low attendance on its initial run in Iranian theatres, with only 130,000 tickets sold. It went on to win four prizes in Iran at the Isfahan Film Festival for Children and Young Adults and at the Fajr International Film Festival. For several years after its release, Kanoon's Channel 2 would broadcast the film every year on New Year's Day. Outside of Iran The White Balloon received excellent reviews and was shown at the 1995 Cannes Film Festival, where it won the Camera d'Or. It also won the Golden Award of the Governor of Tokyo for Best Film and the Bronze Dragon for Best Film of Young Cinema at the 1995 Tokyo International Film Festival, the International Jury Award at the 1995 São Paulo International Film Festival and the Best Film Award at the 1996 Cinéfest Sudbury International Film Festival. It was Iran's official submission for Best Foreign Language Film at the 68th Academy Awards; however, the Iranian government asked the Academy to withdraw the film after Iran's relations with the US began to deteriorate. The Academy refused to withdraw the film, which was not nominated, and Panahi was forbidden by the Iranian government to travel to the Sundance Film Festival or to participate in phone interviews with US reporters to promote the film. Panahi's second feature film was The Mirror, produced by Rooz Films. Initially Panahi was going to direct Kiarostami's script for Willow and Wind, but he decided to pursue his own work instead. Panahi was inspired to make the film when while attending the 1996 Pusan International Film Festival in South Korea he noticed a young girl sitting alone on a park bench staring blankly into space, and realized that he had seen this same thing countless times in Iran and never paid attention to it. He has stated that he "choose a precocious child and placed her in a situation where she is left to her own devices. Everyone she meets on her journey is wearing a mask or playing a role. I wanted to throw these masks away." The film stars Mina Mohammadkhani, the sister of Aida Mohammadkhani. In the film Mohammadkhani could be said to play two characters: the role of a little girl named Baharan and then herself as the film shifts into a documentary mode. Panahi reported casting her after having detected " a feeling of emptiness within her, and a determination to prove herself to the world." It received the Golden Leopard Award at the Locarno Film Festival, the Special Jury Award and Best Director Award at the 1998 Singapore International Film Festival, the Golden Tulip Award at the 1998 Istanbul Film Festival, the FIPRESCI Prize and the Eisenstein Magical Crystal and Cash Award at the 1998 Riga International Film Festival, and Buñuel's Golden Era Award at the Royal Archive Film Festival in Belgium. In 2000 Panahi made The Circle, produced by Jafar Panahi Film Productions and Mikado-Lumiere&Co. Although Panahi claimed that he was not a political filmmaker, his third feature was a major departure from his first two works about children and is critical of the treatment of women under Iran's Islamist regime. Panahi has stated that "I started my career making children’s films, and while doing that I had no problems with censors. As soon as I started making feature films, it all started and I had problems," but that "in my first films, I worked with children and young people, but I began to think of the limitations facing these girls once they grow up. In order to visualize these limitations and to have this constraint better projected visually, I went to a social class, which has more limitations to areas that are more underprivileged, so that this idea could come out ever stronger." He had to wait an entire year to get an official shooting permit. The film was shot in 35 days over a 53-day period. As usual Panahi used non-professional actors, with the exceptions of Fatemeh Naghavi and Fereshteh Sadre Orafaiy. He saw the lead actress, Nargess Mamizadeh, in a park one day and immediately offered her the role. The film opens with one long, handheld shot that lasts over three minutes and took 13 attempts to achieve. Panahi adopted a different camera style to depict each of the four main protagonists' lives. For the first, an idealistic woman he used a handheld camera. For the second woman, the camera is mounted on a constantly moving dolly. The third woman's story is told at night in darker outside, and the camera is static with pans and tight close ups. For the last, least optimistic woman both the camera and the woman are completely immobile and very little sound is used. Panahi submitted the film to the Venice Film Festival without getting a permit from the Ministry of Culture and Islamic Guidance. At the festival it won the Golden Lion, the FIPRESCI prize, the UNICEF prize, the Ecumenical Special Mention, the Sergio Trazzati Award and Mamizadeh won the Italian Film Journalist's Award for Best Actress. The Ministry of Culture and Guidance issued a permit for the film a few days before its screening at the festival, although they already knew that it had been submitted illegally. The Ministry later banned the film in Iran. Panahi was worried that the Ministry would "confiscate and mutilate" all copies of the film, so he made multiple copies and hid them all over Iran. Irans's Cinema Deputy Mohammad-Hassan Pezeshk said that The Circle was banned because it had "such a completely dark and humiliating perspective." It was later withdrawn by Iranian authorities from the Fajr International Film Festival for being "offensive to Muslim women". The film went on to win the FIPRESCI Film of the Year Award at the San Sebastián International Film Festival, appeared on Top 10 lists of critics worldwide and won the Best Film Award at the Montevideo International Film Festival and the Freedom of Expression Award from the National Board of Review. "When people like me do these things, we know what position we are in. We are recognized around the world and so [the authorities] cannot pressure us too much. If something happens to us, it will be reported everywhere and even here [in Iran]. We have to risk pushing the limits for those kids who are just starting off. Those who are making their first films are forced to do whatever they are told; they allow the censors to mutilate their films. If we do not stand up to the censors the conditions will be worse for the young filmmakers. This would mean that this cinema would not continue; it would be suppressed and end with the few people who make films now. A cinema can survive if it has new filmmakers and makes new films. If we don’t resist, the path will be blocked for the new filmmaker and therefore in the eyes of the next generation we will be responsible. There is no other way." Panahi directed Crimson Gold in 2003, produced by Jafar Panahi Productions. The film depicts an impoverished pizza delivery man's failed attempt to rob a jewelry store and the events that drove him to his crime. The story is based on real events that Panahi first heard about when Kiarostami told him the story while they were stuck in a traffic jam on their way to one of Kiarostami's photographic exhibits. Panahi was extremely moved by the story and Kiarostami agreed to write the script for him to direct. Panahi submitted the film to the Cannes Film Festival without being granted a permit from the Ministry of Culture and Islamic Guidance. Panahi had applied for the permit but the Ministry demanded several cuts be made to the film. Panahi refused and submitted the film anyway. At the festival it won the Un Certain Regard Jury Award. It later won the Golden Hugo Award for Best Film at the Chicago International Film Festival. Like The Circle, Crimson Gold was banned in Iran. In 2006 Panahi made Offside. In the film, a group of young Iranian girls disguise themselves as boys to sneak into Azadi Stadium to watch the World Cup qualifying football playoff game between Iran and Bahrain. The film was partially shot during the actual game it depicts. Since the 1979 Islamic Revolution women have been banned from attending football matches in Iran on grounds of rowdy and aggressive language, lewd behavior, and seeing men in shorts and short sleeve shirts. At one point Mahmoud Ahmadinejad had wanted to repeal the law but was overruled by the ulema. Panahi has stated "I use the football game as a metaphor to show the discrimination against women on a larger scale. All my movies have that topic at their center. This is what I am trying to change in Iranian society." The film was inspired by an incident several years earlier when Panahi's daughter was refused entry to a football stadium but ended up sneaking into the stadium anyway. Knowing that the film would be controversial, Panahi and his crew submitted a fake script about some young men who go to a football match to Iranian authorities in order to get permission to make the film. However, before they began shooting the Ministry of Guidance, which issues licenses for films to be shown publicly, told Panahi in advance that because of his past films they would not issue Offside a license until he re-edited his previous films. Not wanting to miss the World Cup tournament, Panahi ignored the Ministry and began shooting the film. As usual, Panahi cast non-professional actors for the film, and the group of young girls in the lead roles were mostly university students that Panahi found through friends who all were passionate fans of football. The film was shot in 39 days and in order to move unnoticed through large crowds Panahi used digital video for the first time so as to have a smaller, more inconspicuous camera. Panahi also officially listed his Assistant Director as the Director of the film so as not to attract the attention of the Ministry of Guidance or the Disciplinary Forces of Tehran, but towards the end of the films shooting a newspaper article about the making of the film listed Panahi as the director and both organizations attempted to shut the film down and confiscate the footage. Only a sequence that takes place on a bus remained to be filmed so Panahi was able to continue filming without being caught. The film premiered in competition at the 2006 Berlin Film Festival, where Panahi was awarded with the Silver Bear Jury Grand Prix. Like The Circle and Crimson Gold before it, Offside was banned from being shown in Iran. Panahi had already set up distribution for the film all over Iran and the film was predicted to break all box office records. Two days after being banned and twenty days before the World Cup championship game, unlicensed DVD copies of the film became available all over Iran. Panahi has stated that of his films Offside is "probably the one that people have seen the most" in Iran. After the film's release a feminist protest group in Iran called the White Scarf Girls began showing up at football matches carrying banners that read: "We don't want to be Offside" Sony Pictures Classics, the film's U.S. distributor, wrote a letter to the Ministry of Guidance in Iran requesting that the film be shown for at least one week in its home country so that they could launch a campaign to nominate the film for Best Foreign Language Film, but the Ministry refused. In 1997 Panahi made the documentary short film Ardekoul. In 2007 he contributed the short film Untying the Knot to the omnibus film Persian Carpet. The film contains one single long take and is inspired by his childhood. In 2010 he made the short film The Accordion, which was commissioned for the THEN AND NOW Beyond Borders and Differences series of short film by Art for The World. It premiered at the 2010 Venice Film Festival. Panahi has referred to the situation in Iran as "the dark ages for filmmaking in Iran" and that he was "presenting the future with something to see, a document of what life was like at that time." On 15 April 2001 Panahi stopped over at the JFK International Airport in New York City en route from Hong Kong to Buenos Aires where he was to participate in a film festival. He was immediately detained by police officers who wanted to fingerprint and photograph him; Panahi refused both requests on the grounds that he was not a criminal. He was threatened with jail and refused an interpreter or a phone call. After being handcuffed and detained at the airport until the next morning, he was finally allowed to make a phone call to his friend Professor Jamsheed Akrami. He was finally photographed and sent back to Hong Kong. In 2003, Panahi was arrested and interrogated for four hours by the Information Ministry in Iran, but was eventually released after being encouraged to move out of Iran. On 30 July 2009, Mojtaba Saminejad, an Iranian blogger and human rights activist writing from inside Iran, reported that Panahi was arrested at the cemetery in Tehran where mourners had gathered near the grave of Neda Agha-Soltan. He was able to contact friends in the film industry, both in Iran and internationally, and the Iranian government was pressured by filmmakers and the news media to release him. He was detained for eight hours until being released. The Iranian government released a statement that he had been arrested mistakenly. In September 2009, Panahi travelled to Montreal to act as the Head of the Jury at the 2009 Montreal World Film Festival. At the festival Panahi convinced the entire jury to wear green scarves during the opening and closing ceremonies in solidarity with the Green Movement in Iran. He also openly supported and appeared in photographs with Iranian Green Movement protesters at the festival. In February 2010, his request to travel to the 60th Berlin Film Festival to participate in the panel discussion on "Iranian Cinema: Present and Future. Expectations inside and outside of Iran" was denied. On 1 March 2010, Panahi was arrested again. He was taken from his home along with his wife Tahereh Saidi, daughter Solmaz Panahi, and 15 of his friends by plain-clothes officers to Evin Prison. Most were released 48 hours later, Mohammad Rasoulof and Mehdi Pourmoussa on 17 March 2010, but Panahi remained in section 209 inside Evin Prison. Panahi's arrest was confirmed by the government, but the charges were not specified. On April 14, 2010, Iran's Ministry of Culture and Islamic Guidance said that Panahi was arrested because he "tried to make a documentary about the unrest that followed the disputed 2009 re-election of President Mahmoud Ahmadinejad." On 18 May, Panahi sent a message to Abbas Baktiari, director of the Pouya Cultural Center, an Iranian-French cultural organization in Paris, stating that he was being mistreated in prison and his family threatened and as a result had begun a hunger strike. On 25 May, he was released on $200,000 bail while awaiting trial. On 20 December 2010, Panahi, after being convicted for "assembly and colluding with the intention to commit crimes against the country’s national security and propaganda against the Islamic Republic," the Islamic Revolutionary Court sentenced Panahi to six years imprisonment and a 20-year ban on making or directing any movies, writing screenplays, giving any form of interview with Iranian or foreign media as well as leaving the country except for Hajj holy pilgrimage to Mecca or medical treatment. Panahi's colleague, Mohammad Rasoulof also received six years imprisonment but was later reduced to one year on appeal. On October 15, 2011, a court in Tehran upheld Panahi's sentence and ban. Following the courts decision, Panahi was placed under house arrest. He has since been allowed to move more freely but he cannot travel outside Iran. Federation of European Film Directors, European Film Academy, Asia Pacific Screen Awards, Network for the Promotion of Asian Cinema, Berlin Film Festival, Karlovy Vary International Film Festival, International Film Festival Rotterdam, Febiofest, National Society of Film Critics, Toronto Film Critics Association and Turkish Cinema Council. France's Ministry of Foreign Affairs and minister of culture and communications Frédéric Mitterrand, German foreign minister Guido Westerwelle, Government of Canada, Finnish Green MP Rosa Meriläinen and Human Rights Watch have condemned the arrest. On 8 March 2010, a group of well-known Iranian producers, directors and actors visited Panahi's family to show their support and call for his immediate release. After more than a week in captivity, Panahi was finally allowed to call his family. On 18 March 2010 he has been allowed to have visitors, including his family and lawyer. Iran's culture minister said on 14 April 2010 that Panahi was arrested because he "was making a film against the regime and it was about the events that followed election." In an interview with AFP in mid-March, Panahi's wife, Tahereh Saeedi, denied that he was making a film about post-election events, saying: "The film was being shot inside the house and had nothing to do with the regime." In mid-March, 50 Iranian directors, actors and artists signed a petition seeking Panahi's release. American film directors Paul Thomas Anderson, Joel & Ethan Coen, Francis Ford Coppola, Jonathan Demme, Robert De Niro, Curtis Hanson, Jim Jarmusch, Ang Lee, Richard Linklater, Terrence Malick, Michael Moore, Robert Redford, Martin Scorsese, James Schamus, Paul Schrader, Steven Soderbergh, Steven Spielberg, Oliver Stone, and Frederick Wiseman signed a letter on 30 April 2010 urging Panahi's release. The petition ends with "Like artists everywhere, Iran’s filmmakers should be celebrated, not censored, repressed, and imprisoned." He was named a member of the jury at the 2010 Cannes Film Festival, but because of his imprisonment he could not attend, and his chair was symbolically kept empty. On 23 December 2010, Amnesty International announced that it was mobilizing an online petition spearheaded by Paul Haggis and Nazanin Boniadi and signed by Sean Penn, Martin Scorsese, Harvey Weinstein and others to protest the jail sentence of Panahi. Cine Foundation International, a "non-profit film company and human rights NGO aiming to 'empower open consciousness through cinema'" announced on 3 January 2011 that they are launching a campaign of protest films and public actions calling for the release of Panahi. "The campaign will include protest films that speak to human rights issues in Iran and throughout the world, six of which are commissioned feature-length, plus twenty shorts. Participating filmmakers may act anonymously or through pseudonyms since voicing their stories can be dangerous. The films, which will address themes of nation, identity, self, spiritual culture, censorship and imprisonment, will be aimed for public, web and various exhibition media". Later in January, CFI deployed a video protest mechanism called White Meadows (named for the Mohammad Rasoulof film, The White Meadows, which was edited by Panahi) and developed by Ericson deJesus (of Yahoo! and frog design) at the request of the foundation. The video mechanism "allow(s) anyone in the world to record a short video statement about Panahi and Rasoulof. There will be an ESCAPE button at top, allowing quick exit for those in countries where recording a statement would be dangerous. There will an option to have the screen black, and soon, voice distortion. The video statements will be recorded as mp4s, giving them maximum transmedia capacity, which essentially makes them broadcastable from any device that can show video". Users can also use the mechanism to comment on how they would "like to see as an international response by the film industry", comment on the state of human rights in general, or to "report a human rights abuse to the world". In his March 2011 greetings to the Iranian people on the occasion of the Iranian New Year, U.S. President Barack Obama cited Panahi as an example of the oppressive regime that currently controls the country of Iran. In April 2011 Time Magazine named Panahi number 3 in their list of the Top 10 Persecuted Artists who have challenged authority. In Spring 2011, Boston's American Repertory Theater and System of a Down's Serj Tankian dedicated their production of Prometheus Bound to Panahi and seven other activists, stating in program notes that "by singing the story of Prometheus, the God who defied the tyrant Zeus by giving the human race both fire and art, this production hopes to give a voice to those currently being silenced or endangered by modern-day oppressors". On 26 October 2012, Panahi was announced as a co-winner of the Sakharov Prize of the European Parliament. He shared the award with Iranian human rights lawyer Nasrin Sotoudeh. European Parliament President Martin Schulz called the pair "a woman and a man who have not been bowed by fear and intimidation and who have decided to put the fate of their country before their own". Catherine Ashton, the European Union High Representative of the Union for Foreign Affairs and Security Policy, stated of the prize, "I am following the case of Nasrin Sotoudeh and other human rights defenders with great concern ... We will continue to campaign for the charges against them to be dropped. We look to Iran to respect the human rights obligations it has signed up to". Panahi's daughter Solmaz accepted the award for Panahi. In March 2013, Columbia University professor Hamid Dabashi wrote an article that was highly critical of Panahi and his decision to continue making films, and partially blames Panahi for the "tragic endings of Iranian cinema". Dabashi had previously written extensively about and praised Panahi during the director's early career. Dabashi called Panahi's two post-arrest films "self-indulgent vagaries farthest removed from" his previous films and wrote that Panahi "should have heeded the vicious sentence and stayed away from his camera for a while and not indulge, for precisely the selfsame social punch that have made his best films knife-sharp precise has now dulled the wit of the filmmaker that was once able to put it to such magnificent use." In June 2013 Panahi was invited to join The Academy of Motion Picture Arts and Sciences. In August 2013, shortly after the election of Iranian President Hassan Rouhani, several well known political prisoners were released. One such prisoner was Panahi's Sakharov Prize co-winner Nasrin Sotoudeh, whose release prompted European Parliament President Martin Schulz to say "We are eagerly waiting to welcome her in Strasbourg together with her Sakharov Prize co-winner, film director Jafar Panahi." A few days earlier the famed House of Cinema, Iran’s largest professional guild for filmmakers, was re-opened after having been deemed illegal in January 2012. In the middle of the controversy and court appeal, Panahi broke the ban imposed on him from making films and made the documentary feature This Is Not a Film (2011) in collaboration with Iranian filmmaker Mojtaba Mirtahmasb. This film was made for €3,200 and shot on a digital camcorder and, partly, an iPhone. It was shot in four days over a ten-day period in March 2011 and its title was inspired by René Magritte's painting The Treachery of Images. In the film, Panahi sits in his apartment making phone calls about his court case, watching TV news stories, interacting with his neighbors, talking about his past films and describing scenes from the film that he had begun shooting when he was arrested (much as he had described scenes from films to his sisters as a child). Ten days before the opening of the 2011 Cannes Film Festival, This Is Not a Film was announced as a surprise entry into the festival. It was smuggled out of Iran on a USB thumb drive that had been hidden inside a cake. Panahi's wife and daughter attended the festival. In December 2012 it was shortlisted as one of 15 films eligible for Best Documentary Feature at the 85th Academy Awards. In October 2012, Kiarostami told a journalist that Panahi had completed a new film which he predicted would be screened in film festivals. In January 2013 the Berlin Film Festival announced that it would premiere Closed Curtain (Pardeh) at its 2013 festival. This new film was co-directed by Panahi and Kambozia Partovi, who both appear in the film along with cast members Maryam Moqadam and Hadi Saeedi. Berlin Film Festival director Dieter Kosslick is a long time supporter of Panahi and said that he "asked the Iranian government, the president and the culture minister, to allow Jafar Panahi to attend the world premiere of his film at the Berlinale." In the film Partovi and Moqadam star as two people wanted by the police who hide out in a house on the Caspian Sea and always keep the curtains closed to avoid detection. The film was shown in competition at the 63rd Berlinale in February 2013 where Panahi won the Silver Bear for Best Script. In January 2015 it was announced that Panahi's film Taxi was scheduled to premiere in competition at the 65th Berlin International Film Festival. Panahi was awarded the Golden Bear for the film at the festival. It has been described as "a portrait of the Iranian capital Tehran" and as a "documentary-like film is set in a Tehran taxi that is driven by Panahi." In December 2014 Panahi won a 2014 Motion Picture Association Academy Film Fund grant for $25,000 for the screenplay Flower (Gol). He was awarded the grant at the 8th annual Asia Pacific Screen Awards in Brisbane, Australia. The script is about disabled people in Iran and will be directed by Panahi's son Panah Panahi. Panahi will be the executive producer of the film. It has been described as exploring "the turmoil created by a father’s conviction that he must kill his disabled son to bring peace to his family. This challenging drama is drawn from real life, and brings home the plight of people with disabilities in Iran. This film will be directed by Jafar’s son, Panah, who is an emerging director of distinction and shares his father’s humanist concerns." Panahi's style is often described as an Iranian form of neorealism. Jake Wilson describes his films as connected by a "tension between documentary immediacy and a set of strictly defined formal parameters" in addition to "overtly expressed anger at the restrictions that Iranian society imposes". The movie was in part filmed during the event it dramatizes—the Iran-Bahrain qualifying match for the 2006 FIFA World Cup. "Panahi's films redefine the humanitarian themes of contemporary Iranian cinema, firstly, by treating the problems of women in modern Iran, and secondly, by depicting human characters as 'non-specific persons'—more like figures who nevertheless remain full-blooded characters, holding on to the viewer's attention and gripping the senses. Like the best Iranian directors who have won acclaim on the world stage, Panahi evokes humanitarianism in an unsentimental, realistic fashion, without necessarily overriding political and social messages. In essence, this has come to define the particular aesthetic of Iranian cinema. So powerful is this sensibility that we seem to have no other mode of looking at Iranian cinema other than to equate it with a universal concept of humanitarianism." Panahi says that his style can be described as "humanitarian events interpreted in a poetic and artistic way". He says "In a world where films are made with millions of dollars, we made a film about a little girl who wants to buy a fish for less than a dollar [The White Balloon]—this is what we're trying to show." Panahi has stated that "in all of my films, you never see an evil character, male or female. I believe everyone is a good person." In an interview with Anthony Kaufman, Panahi said: "I was very conscious of not trying to play with people's emotions; we were not trying to create tear-jerking scenes. So it engages people's intellectual side. But this is with assistance from the emotional aspect and a combination of the two." Hamid Dabashi has called Panahi the least self-conscious filmmaker in the history of Iranian film and that his films represent a post-revolutionary Iranian outlook on itself, calling Crimson Gold not just a history of a failed jewellery robbery, "but also [a history] of recent Iranian history, the history of the failed Islamic revolution and the Iran-Iraq war in particular." Dabashi goes on to praise Panahi's restrained depiction of violence, stating that Panani's "manner of showing violence without showing who has perpetrated it has now become a trademark of Panahi's cinema." Dabashi specifically cites Razieh's brother in The White Balloon as clearly having been beaten in one scene, but only being given hints of the violence of Razieh's father from off screen. In The Circle, Nargress has been beaten, but we are never told why or by whom. Dabashi goes on to state that "violence in Panahi's cinema is like a phantom: you see through it, but it lacks a source or physical presence—who has perpetrated it is made intentionally amorphous. The result is a sense of fear and anxiety that lurks in every frame of his film, but it is a fear without an identifiable referent." Some Iranians have criticized his work, claiming that his films "don't draw a realistic picture of Iran, or that the difficulties encountered by women in [his] films apply to only a certain class of women." Panahi is married to Tahereh Saidi, who he first met while he was in college when she was working as a nurse. Together they have a son, Panah Panahi, born in 1984 and a daughter, Solmaz Panahi. Panah Panahi attended the University of Tehran and in 2009 made his first short film, The First Film, which was screened at the 2009 Montreal World Film Festival. His daughter Solmaz studied theater in Tehran. ^ Dabashi, Hamid. Masters and Masterpieces of Iranian Cinema. Washington D.C.: Mage Publishers. 2007. pp. 420. ^ a b "Filmmaker Jafar Panahi sentenced to six years in prison". The Green Voice of Freedom (part of The Green Path of Hope association). 20 December 2010. Archived from the original on 2010-12-24. ^ a b Connolly, Kate (15 February 2015). "Banned Iranian director Jafar Panahi wins Berlin film festival's Golden Bear". Retrieved 15 February 2015. ^ "3 FACES Award for Best Screenplay (tied), 2018". 19 May 2018. Retrieved 19 May 2018. ^ a b c d "In Real Time: An Interview with Jafar Panahi". offscreen.com. Retrieved 22 May 2012. ^ a b c d e f Stone, Judy. Eye on the World: Conversations with International Filmmakers. Silman-James Press, Los Angeles, 1997, ISBN 1-879505-36-3, pp. 386. ^ "Son Of Imprisoned Iranian Filmmaker Jafar Panahi Says His Father Still Sees Beauty". rferl.org. Retrieved 22 May 2012. ^ a b c d "Son Of Imprisoned Iranian Filmmaker Jafar Panahi Says His Father Still Sees Beauty". Radio Free Europe Radio Liberty. 22 December 2010. Retrieved 26 June 2012. ^ "The Case of Jafar Panahi". sensesofcinema.com. Retrieved 16 February 2015. ^ "Remarks by JAFAR PANAHI". filmscouts.com. Retrieved 22 May 2012. ^ a b c d e f g h "Articles". Massoud Mehrabi. Retrieved 16 June 2011. ^ "Interview at Senses of Cinema by Stephen Teo". ^ a b Dönmez-Colin. pp. 226. ^ a b c Stone, Judy. Eye on the World: Conversations with International Filmmakers. Silman-James Press, Los Angeles, 1997, ISBN 1-879505-36-3, pp. 386–387. ^ "The Case of Jafar Panahi – An Interview with the Iranian Director of The Circle". sensesofcinema.com. Retrieved 16 February 2015. ^ "Rotton Tomatoes page". rottentomatoes.com. Retrieved 22 May 2012. ^ Stone, Judy. Eye on the World: Conversations with International Filmmakers. Silman-James Press, Los Angeles, 1997, ISBN 1-879505-36-3, pp. 387. ^ Stone, Judy. Eye on the World: Conversations with International Filmmakers. Silman-James Press, Los Angeles, 1997, ISBN 1-879505-36-3, pp. 385–386. ^ a b Dönmez-Colin. pp. 224. ^ a b c "In Real Time: An Interview with Jafar Panahi". Offscreen.com. 30 November 2009. Retrieved 25 June 2012. ^ a b c "My interview with Jafar Panahi". dougsaunders.tumblr.com. 23 May 2010. Archived from the original on 9 November 2015. Retrieved 25 June 2012. ^ a b c Dönmez-Colin. pp. 91. ^ The Circle DVD Special Features, Jafar Panahi interview. Fox Lorber Films. 2001. ^ a b Zeydabadi-Nejad, Saeed (2010). The Politics of Iranian Cinema. Film and society in the Islamic Republic. London & New York: Rutledge. p. 148. ISBN 978-0-415-45537-4. ^ a b Dönmez-Colin. pp. 232. ^ a b c Zeydabadi-Nejad. p. 151. ^ "Profile – Panahi, Jafar: Director Career". Emanuellevy.com. Retrieved 16 June 2011. ^ a b Dabashi. pp. 394. ^ "An interview with Jafar Panahi, director of Crimson Gold". World Socialist Web Site. 17 September 2003. Retrieved 25 June 2012. ^ a b "An Interview with Jafar Panahi". reverseshot.com. Retrieved 25 June 2012. ^ a b "Offside rules: an interview with Jafar Panahi". openDemocracy. 6 June 2006. Retrieved 25 June 2012. ^ a b "Jafar Panahi, An Interview". www.reflectionson.us. 2007. Archived from the original on 5 May 2011. Retrieved 25 June 2012. ^ " Offside rules: an interview with Jafar Panahi", OpenDemocracy, 6 June 2006. Retrieved 4 December 2011. ^ a b c d e Offside DVD Special Features, Jafar Panahi interview, Sony Pictures Classics, 2007. ^ a b "Interview with Jafar Panahi, part two". Outside the Frame. 25 September 2009. Retrieved 26 June 2012. ^ "Iranian film-maker Jafar Panahi banned from Venice film festival". The Guardian. 2 September 2010. Retrieved 27 June 2012. ^ Cathcart, Michael (7 May 2001). "Iranian Filmaker [sic] Jahar Panafi detained at JFK airport New York". ABC.net. Retrieved 28 October 2014. ^ "Interview with Jafar Panahi, part one". Outside the Frame. 25 September 2009. Retrieved 26 June 2012. ^ "Interview with Jafar Panahi, part one". 25 September 2009. Retrieved 25 June 2012. ^ "Iranian Director Jafar Panahi Denied Permission to Leave Iran". 16 February 2010. Archived from the original on 20 February 2010. Retrieved 6 March 2010. ^ "Article on BBC Persian". Bbc.co.uk. Retrieved 16 June 2011. ^ "Jafar Panahi in Evin ward 209". 6 March 2010. Archived from the original on 27 July 2011. ^ Fathi, Nazila (2 March 2010). "Iran Arrests Filmmaker Who Backed Opposition". New York Times. Retrieved 5 May 2010. ^ "Jafar Panahi, The message from Jafar Panahi – La Règle du Jeu". Laregledujeu.org. Retrieved 16 June 2011. ^ Black, Ian (25 May 2010). "Jafar Panahi freed from jail in Iran". The Guardian. Archived from the original on 27 October 2012. ^ "Iranian court upholds sentence against filmmaker Jafar Panahi". AFP. Retrieved 15 May 2013. ^ Mackey, Robert (9 March 2010). "Iranian Filmmaker Speaks Out on Prisoners". The New York Times. Retrieved 5 May 2010. ^ "Variety – Fate of Iranian director still unknown". 19 March 2010. ^ "Jafar Panahi Arrest: European Film Academy protests". 5 March 2010. ^ "NETPAC calls for the release of Jafar Panahi". 3 March 2010. Archived from the original on 15 March 2010. ^ "Berlinale Statement on Jafar Panahi's arrest". 11 March 2010. Archived from the original on 29 December 2010. Retrieved 6 March 2010. ^ "Karlovy Vary IFF joins protesting the arrest of this renowned artist". ^ "IFFR's statement against arrest of Jafar Panahi". ^ "TFCA Calls for Release of Jafar Panahi". 16 March 2010. Archived from the original on 23 March 2010. ^ Borzou Daragahi (3 March 2010). "Acclaimed Iranian filmmaker arrested in late-night raid". Los Angeles Times. Retrieved 3 March 2010. ^ "Federal Minister Westerwelle calls for the release of Iranian filmmaker Jafar Panahi". 3 March 2010. ^ "Iran: Indict or Free Filmmakers". 12 March 2010. ^ a b "Panahi arrested for making anti-regime film: minister". Agence France-Presse (AFP). 14 April 2010. Retrieved 1 May 2010. ^ "Panahi arrested for making anti-regime film: minister". 14 April 2010. Archived from the original on 3 July 2012. ^ Lang, Brent (30 April 2010). "Hollywood Rallies to Iranian Director's Defense". The Wrap. Retrieved 1 May 2010. ^ "Iranian director Panahi protests innocence from jail". Google News. Agence France-Presse. 15 May 2010. Archived from the original on 27 October 2012. Retrieved 26 October 2012. ^ Fleming, Mike. "UPDATE: Martin Scorsese Lends Name To Amnesty International Protest Of Prison Sentences For Iranian Filmmakers –". Deadline.com. Retrieved 16 June 2011. ^ "Paul Haggis, Sean Penn, Martin Scorsese and Harvey Weinstein Join Amnesty International to Condemn Harsh Sentence for Acclaimed Iranian Director Jafar Panahi | Amnesty International USA". Amnestyusa.org. 28 December 2010. Archived from the original on 29 March 2011. Retrieved 16 June 2011. ^ "Cine Foundation International Launches Protest Film Campaign, Calls for Panahi Release – Thompson on Hollywood". Blogs.indiewire.com. 3 January 2011. Archived from the original on 7 January 2011. Retrieved 16 June 2011. ^ "Cine Foundation International » 'Films For Jafar Panahi & Mohammad Rasulov' — Human Rights Cinema Campaign by Cine Foundation International — Press Release". Cinefoundation.org. Archived from the original on 29 October 2014. Retrieved 16 June 2011. ^ Barnes, Brooks (21 January 2011). "Sundance Gets a Taste of Iranian Politics". The New York Times. ^ "Video App Honors Imprisoned Filmmakers, Offers New Way for World to Support Human Rights". Payvand Iran News. San Francisco Bay Area: NetNative. 20 January 2011. Retrieved 29 October 2014. ^ "Cine Foundation International » WHITE MEADOWS". Cinefoundation.org. Archived from the original on 10 June 2011. Retrieved 16 June 2011. ^ "Simin Behbahani & Jafar Panahi in Obama greetings for Iranian new year". www.lenziran.com. 21 March 2011. Retrieved 28 June 2012. ^ "Top 10 Persecuted Artists". Time Warner. 5 April 2011. Retrieved 28 June 2012. ^ "About the Prometheus Project". American Repertory Theater. 15 February 2011. Retrieved 16 May 2011. ^ a b Saeed Kamali Dehghan (26 October 2012). "Nasrin Sotoudeh and director Jafar Panahi share top human rights prize". The Guardian. Archived from the original on 26 October 2012. Retrieved 26 October 2012. ^ "Jailed Iranians win EU prize". United Press International. 26 October 2012. Archived from the original on 26 October 2012. Retrieved 26 October 2012. ^ "2012 Sakharov Prize: a cry for justice and freedom in Iran". The European Parliament. 12 December 2012. Archived from the original on 20 May 2013. Retrieved 26 December 2012. ^ Hamid Dabashi (21 March 2013). "The tragic endings of Iranian cinema". Aljazeera. Retrieved 24 March 2013. ^ Nicole Sperling (28 June 2013). "Film academy adds 276 new members; increase in minorities, women". The Los Angeles Times. Retrieved 1 July 2013. ^ Nasser Karimi (18 September 2013). "Iran releases human rights lawyer, other prisoners". The Associated Press. Retrieved 22 September 2013. ^ Ben Child (13 September 2013). "Iran reopens film guild under new president". The Guardian. Retrieved 22 September 2013. ^ "Cannes Q. and A.: The Loneliness of the Banned Filmmaker". the New York Times. 21 May 2011. Retrieved 25 June 2012. ^ "15 Documentary Features Advance In 2012 Oscar® Race". Oscars.org. 2012-12-22. Retrieved 2012-12-25. ^ "EXCLUSIVE: Banned From Filmmaking, Jafar Panahi Has Made Another Movie, Says Abbas Kiarostami". indiewire.com. October 12, 2012. Retrieved January 20, 2013. ^ "Berlin Festival Adds Jafar Panahi's 'Closed Curtain', Steven Soderbergh's 'Side Effects'". deadline.com. January 11, 2013. Retrieved January 20, 2013. ^ "BERLIN 2013: Steven Soderbergh's 'Side Effects,' Shia LaBeouf Action Comedy in Competition". hollywoodreporter.com. January 11, 2013. Retrieved January 20, 2013. ^ "Berlin: Chilly fest kicks off with protestors, celebs". variety.com. February 7, 2013. Retrieved February 10, 2013. ^ "Pardé". berlinale.de. February 7, 2013. Retrieved February 10, 2013. ^ The Awards Die Preise 63rd Internationale Filmfestspiele Berlin Retrieved 26 March 2013. ^ "Jafar Panahi's New Film in Competition. Sebastian Schipper, Werner Herzog, Benoit Jacquot and Further Titles Added to the Selection". Berlinale. January 14, 2015. Retrieved January 18, 2015. ^ "Banned Iranian filmmaker part of the Berlin Film Festival lineup". Haaretz.com. January 14, 2015. Retrieved January 18, 2015. ^ "Berlinale to screen "Atom-Heart Mother"". Tehran Times. 16 January 2015. Archived from the original on 19 January 2015. Retrieved 18 January 2015. ^ Frater, Patrick (December 12, 2014). "Jafar Panahi, Mostofa Sarwar Farooki Among APSA-MPA Award Winners". Variety. Retrieved January 19, 2015. ^ "2014 APSA Academy Film Fund recipients announced". Asian Pacific Screen Awards. December 11, 2014. Retrieved January 19, 2015. ^ Mitchell, Wendy (December 12, 2014). "MPA APSA Fund awards $25,000". Screen Daily. Retrieved January 19, 2015. ^ "The Case of Jafar Panahi". ^ "2006 in Review – by Leo Goldsmith". notcoming.com. Retrieved 16 June 2011. ^ "An interview with Jafar Panahi, director of The Circle". World Socialist Web Site. 2 October 2000. Retrieved 25 June 2012. ^ a b Dabashi. pp. 395. ^ a b Dabashi. pp. 396. ^ "asiapacificfilms.com catelog". asiapacificfilms.com. Retrieved 22 May 2012. ^ "Iranian Cinema Awarded at Montreal World Film Festival". iranreview.org. Retrieved 22 May 2012. ^ "Festival de Cannes: Crimson Gold". festival-cannes.com. Archived from the original on 12 June 2012. Retrieved 8 November 2009. 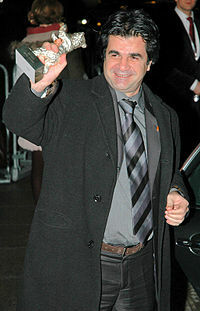 Wikimedia Commons has media related to Jafar Panahi.